Jim Warren has been a live sound and studio engineer for longer than he can remember. His credits include work with Radiohead (17 years), Crowded House, Peter Gabriel, Duran Duran, Nine Inch Nails, Art of Noise, Sufjan Stevens, Turin Brakes, Doves, Auteurs, Black Box Recorder, Chapterhouse and The Wedding Present. 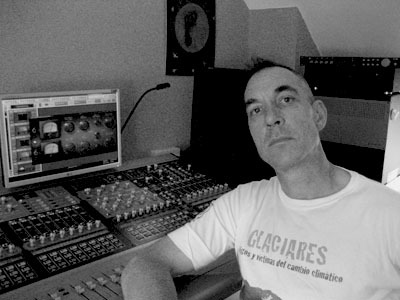 He received the TEC award for Live Sound Production of the year in 2003 with Peter Gabriel and in 2004 with Radiohead. Jim first worked with Tim Arnold back in the Jocasta days, mixing live shows and recording several album tracks and B-sides for the band. And here is a photograph. I'm sorry, that's about as good as they get when I'm in them.